I set up a Gmail email address in Outlook 2013 the other day. The customer wanted his Gmail account set up as an IMAP account. I entered the settings and configured the account. Everything was working fine besides the fact the “all mail” folder was missing. There is a simple fix for this. Step One: Right-click on your Gmail account in Outlook and click new folder. Name the new folder All Mail. 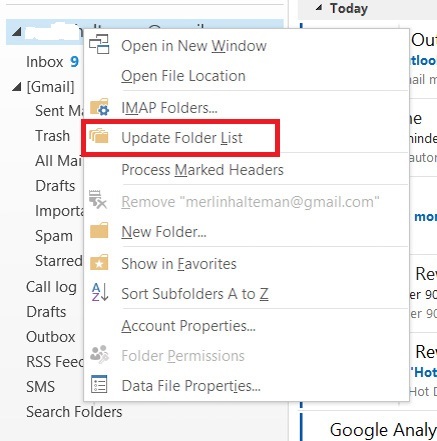 Step Two: Right-click on your email account select Update Folder List. Your email account will synchronize your folders and will now bring down your email into your “All Mail” folder. That was the “fix” that worked for me. If this didn’t fix your problem you can also try the following suggestion. 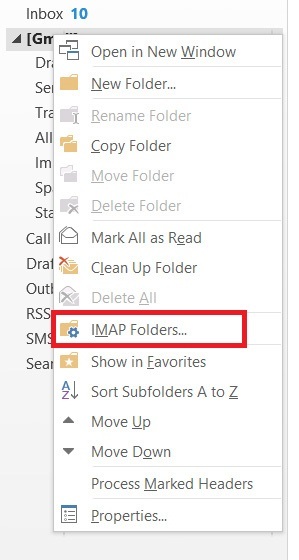 Right-click on the [Gmail] header and select IMAP folders. Now click query to show all the available folders. Make sure All Mail is listed and you are subscribed to that folder. If you aren’t subscribed to the “All Mail” folder, click subscribe and OK. You should be all set! This entry was posted in Tips, Troubleshooting and tagged Gmail, IMAP, Outlook 2013 on January 7, 2015 by Merlin Halteman. Tried so, in my case ‘all mail’ is already subscribed yet its not displaying. Thanks. This solution worked but it took 20 mins to sync-up 20k emails. 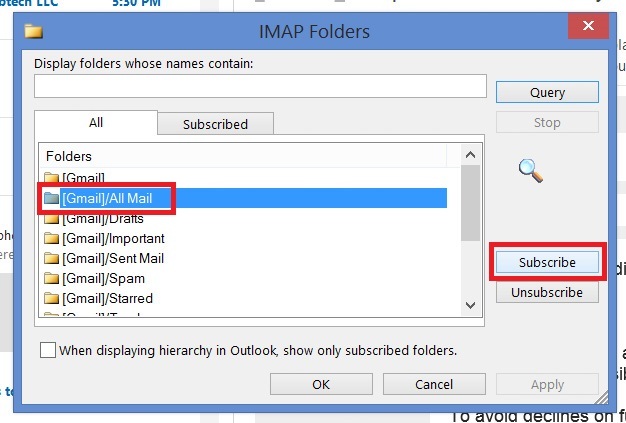 Just a note that Gmail is case sensitive about folder names, so make sure your Outlook “All Mail” folder is exactly the same is the one in Gmail itself.